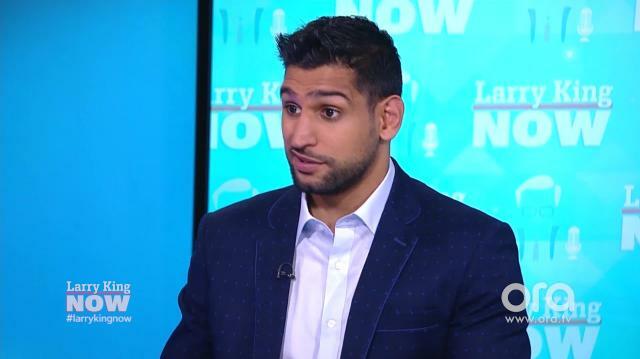 While discussing the recent implementation of the "Trump travel ban 2.0," British boxer AmirKhan reveals to Larry that he's been held at U.S. airports for hours at a time simply because of his name and ethnicity. He also says he had the opportunity to discuss these instances of profiling with Hillary Clinton, who personally told him she'd assist in making sure they'd no longer happen. Larry King: Now the Supreme Court in the United States, they partially allowed a travel ban. You can go if you have relatives, if you have a job, but if you don’t have any of those that’s kind of a stay, and then they’re going to hear the whole case in October, what do you make of that ban? Partial ban. Amir Khan: The partial ban, yeah. Um, I mean I could tell you a little story about myself, I used to...I still train in America, I travel to America quite oftenly, and I used to always get pulled over because of my name, it pops up as a terrorist name. Larry King: They’d stop you at the airport? Amir Khan: Yep, all the time. Customs. And they used to recognize me, and they’d know who I was and say “Look Amir we apologize but we have to do what the system tells us…” and I had to, and...It just kept happening and happening and you know, after a long flight, after a long 13 hour flight you’re stuck in the airport 2-3 hours, it does take a lot out of you. So, I met Hillary Clinton, when I was in Washington, I was invited to an event there - and I told her and she said look, give me your details and let me try to help you, can you send me the email? We’ll clarify you as you’re a safe person to travel. Now, by putting this ban on I think it’s only going to make so many people get frustrated, it’s going to frustrate so many people from coming to America...I mean I don’t know much about it, but I just think it’s a little bit sad to see that people are not allowed - especially Muslims - are banned from going to America because there’s so many of us over there who also have families there, we have friends there. I go there to train, and I never want to come across the day where they say to me “Sorry Mr. Khan, you can’t come to America because you’re Muslim. That would hurt me so much because all my training is there, so I just don’t know where this world’s going to go. Larry King: So what do you think of President Trump? Amir Khan: Um…(laughs)...I mean he’s uh...he’s very vocal, um. If you’re going to ask me I liked Obama better, I thought he was amazing, I think what he did for America was amazing, but he’s uh...but look at the end of the day, whoever is going to go in power is going try to make the country - try to make the country - safe, and everyone get on together. I mean, that’s what we want. We can’t have people like Donald Trump saying to people - saying to the Muslims, you’re getting banned from coming to America. He needs to be neutral.